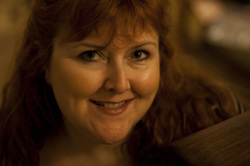 Rebecca has been working as writer & performer for nearly twenty years. Her plays for stage & radio have been performed by companies all over the world, winning numerous awards and been broadcast by BBC Radio. Her play "The Regina Monologues" has recently been re-published by Samuel French. An award-winning published poet, she had a collection of her one act plays published by Methuen. Rebecca is represented for screenwriting by Steven Russell. A contemporary retelling of the story of Henry VIII, told through the eyes of his six wives, that chronicles his rise to become the idealistic head of his father's company and his ultimate downfall. A struggling physician finds himself promoted to the court of King James I and uses his new influence to try to reform the Crown’s mental hospital, then little more than a squalid prison, the infamous ‘Bedlam’. The story of the workers and customers in a small community's pharmacy. A retelling of Jason and the Argonauts, with an intergalactic comic twist. Shortlisted in the 2012 Emerging Screenwriters Competition. Joan Lane, Wild Thyme Productions. Three friends attempt to take revenge on their unscrupulous boss by duping him into believing they've found Bob Dylan's long lost demo tapes. Exec producer David Hunter, BBC. A heartbroken husband, his wife desperate for a child after a series of miscarriages, discovers the truth about their new baby son & decides to keep it a secret from the police as long as he can. A murderous thriller set in 1950s America. A docudrama that examines the cause of one of the world's biggest killers. A documentary series charting the growth of the pharmaceutical industry, from neighbourhood quacks and apothecaries to a multi-billion dollar global industry. University of the Creative Arts. The moving tale of the final weeks in a devoted couple's long marriage. Adapted from her own one act play. Comedy drama examining the impact of Alzheimer's. Winner, Scott Salver SCDA Festival 2009. Tidemark/St Albans Abbey Theatre Studio. The rise and fall of an artist battling alcoholism. Comedy drama telling the story of Henry VIII through interlocking monologues from his six wives. Sold out runs in Edinburgh & London. Published by Samuel French; click to buy. One of a series of monologues under the umbrella of Red Man Green Man. A modern retelling of Homer's Odyssey with a comic twist. Bob's mother is in a coma & so is his marriage. Three vignettes set in the men's toilet of a local village hall. Three vignettes set in the lady's toilet of a local village hall.